I’ve been getting ready for weeks. Firmed up stops at indie bookstores in Laramie, Cheyenne, Casper, Cody, & Jackson the week of August 8–12. Towns that form a diagonal across the state from southeast to northwest Wyoming, through Yellowstone National Park to the Grand Tetons. I have contacted bookstores and local newspapers with names that echo the rural West: The Second Story in Laramie, City News in Cheyenne, Wind City Books in Casper, Legends Bookstore in Cody, and Valley Bookstore in Jackson; the Laramie Boomerang and the Jackson Hole News&Guide. 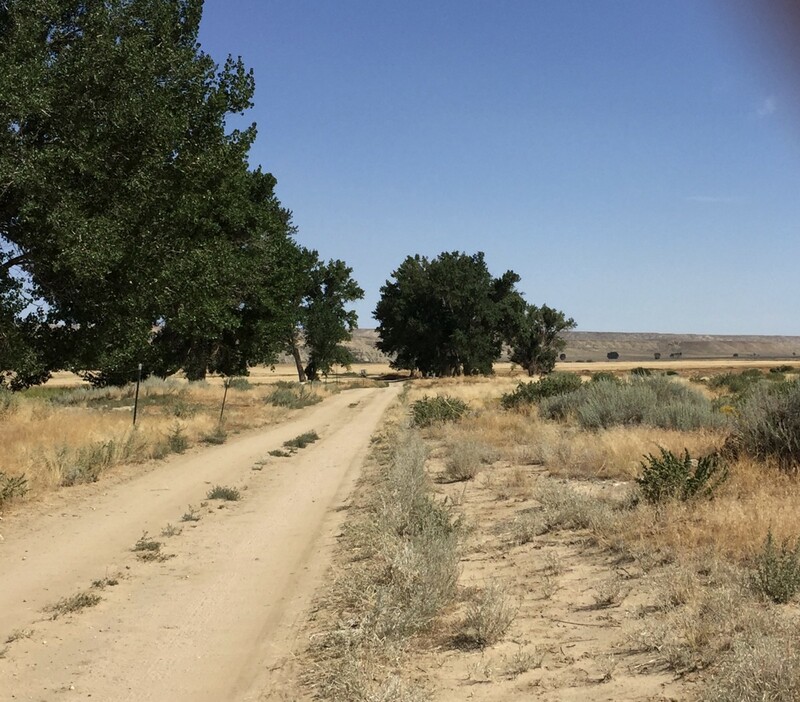 After Cody, Bob and I will drive to our family ranch near Clark where my family lived in the mid-1950s — the place that inspired my debut novel, Hardpan. But this time our ranch house won’t be there. During my last visit in 1973, I didn’t imagine our ranch house would burn down some twenty years later. Even so, the ranch land will be there — all thirteen hundred acres of it. So jump into the old pickup, my friends. Come along with me on this sentimental journey to the old West of the 1950s. The West before paved roads found remote cattle ranches in northwest Wyoming. The West before TVs and computers and the Internet took over everyday communications. Together we’ll discover today’s new pioneers in this starkly beautiful landscape. My appointment for the book signing was at eleven o’clock Monday morning. I was eager to get out of the car and explore Laramie after the two-and-a-half hour drive over Hwy 287 from Denver. It wasn’t until I peeked inside the doorway of the two-story red brick building in the historic downtown that I connected the dots. 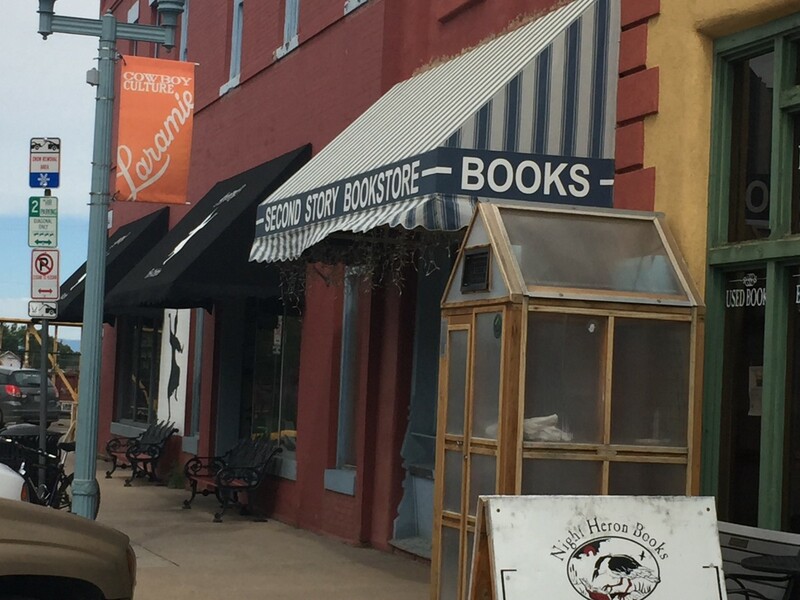 I had just walked past the window display of books, typical for storefront bookstores, so I wasn’t expecting a large black arrow affixed to the inside staircase pointing upstairs to The Second Story. Ahh…I thought. That explains the store’s unusual name. From the street, one wouldn’t imagine a bookstore on the upper level suffused with daylight and a central space the size of a dance hall, complete with old wooden floor. Later, I learned this room was used as a dance hall in the decades before it became a place of literary pursuit in the 1980s. The dance space was now stocked with tables and portable shelves filled with books — fiction and regional picks — as well as specialty items geared to tourists eager to take home a treasure reminiscent of the old West. 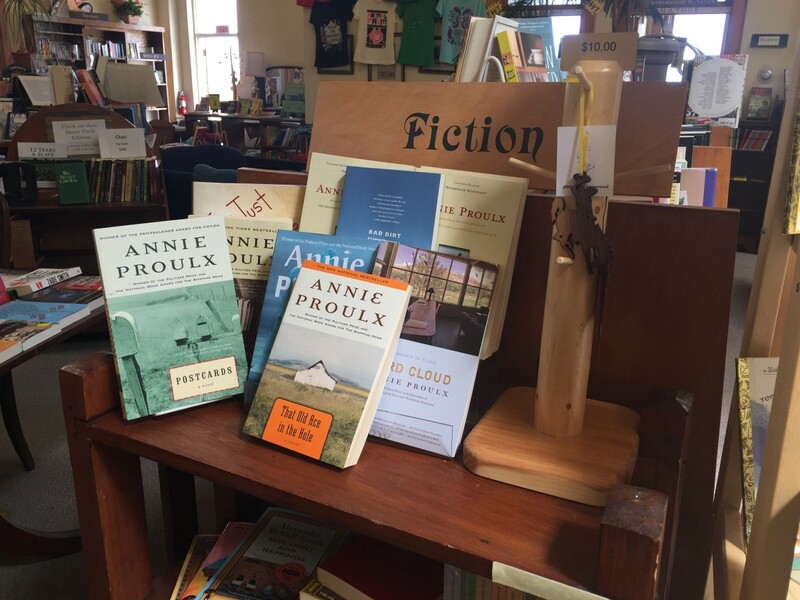 I was delighted to discover a small trove of books by Annie Proulx, a source of inspiration for my own writing. My curiosity was piqued by numerous doors opening to smaller rooms devoted to specialty books on a range of subjects like Travel and Cooking. These book nooks reminded me of our upper grades school “library” in Clark, Wyoming in the 1950s. Shelves of bookssurrounded a tiny sitting space big enough for two metal folding chairs at the top of a narrow staircase adjacent to the classroom. That’s where my teacher used to assign me to tutor my rambunctious classmate, David Torczon, in math while she taught the rest of the class below. I remembered David leaping down the short flight of stairs one day, landing squarely onto Mrs. Lockhart as she opened the door, sending her sprawling to the floor. I watched in horror from my chair above the fray as Mrs. Lockhart grasped David’s arm to pull herself upright. Our teacher recovered more slowly than her student — she being about sixty, and he, about ten. But she got even by denying him recess outdoors for the rest of the week — a severe punishment for an energetic Wyoming boy. 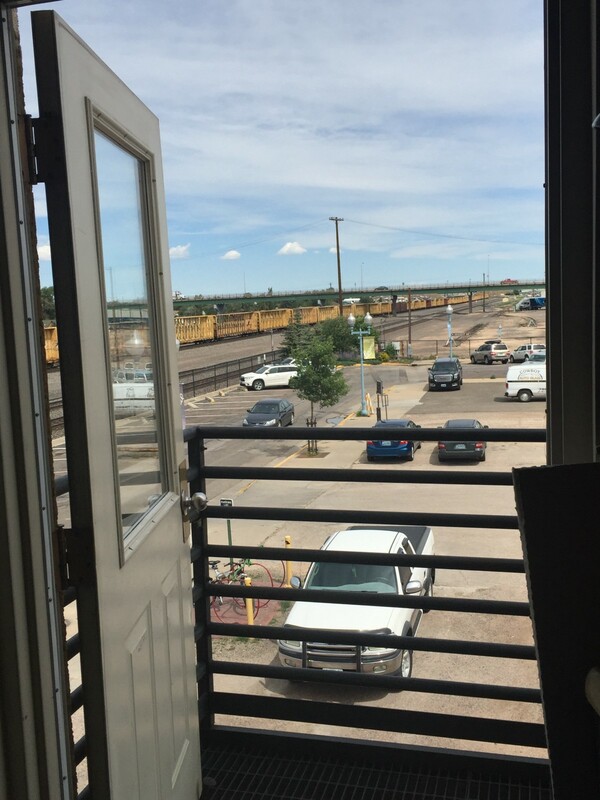 “Oh,” I said nonchalantly as I gazed toward an open door in the back with a view of the railroad tracks behind the old hotel. The tracks harken back to 1868 with the arrival of the Union Pacific railroad when Laramie was founded. Clearly, they are still in use. Worthy of note this presidential election year: Laramie has the honor of being the first city in the nation to grant women the right to vote, in 1870. The fifty-two mile drive on I-80 from Laramie to Cheyenne should take only an hour, but Bob and I were distracted by numerous historic markers and geological sites along the way. 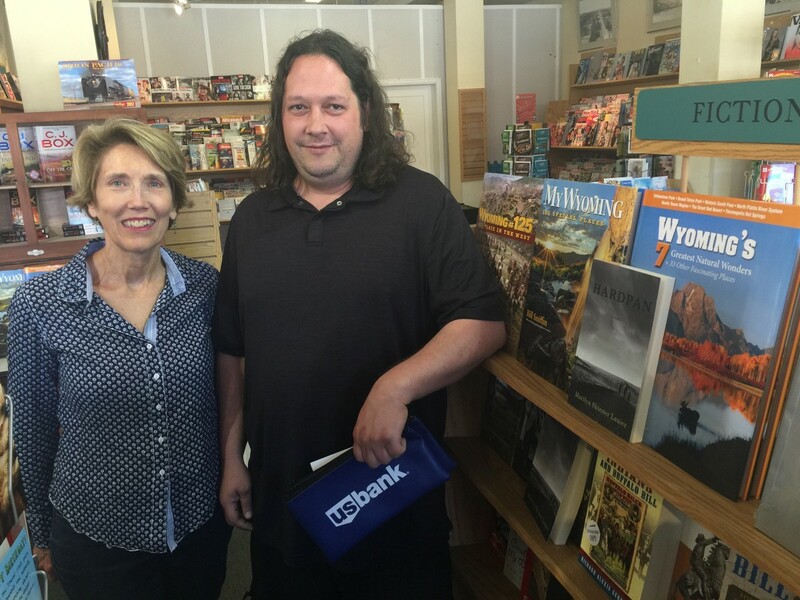 Despite the pit stops, we arrived in Cheyenne in time for my scheduled afternoon visit to the City News Bookstore. Located on the corner of 18th & Carey in downtown Cheyenne, blocks from the central train depot, City News is aptly named. It speaks of an era when newspaper was king, and locals dropped by the corner store for a copy of today’s paper, a quick cup of coffee, or a big cigar. Add some books and magazines to the mix, including a couple of shelves devoted to books on Wyoming, and you’ve got the twenty-first century version of the corner bookstore. I greeted Travis Russell like an old friend. Though he couldn’t schedule a book signing in the tight quarters, I was grateful for his willingness to display Hardpan on the already-crowded shelf. He also purchased two copies of my book, and declared his intention to read a chapter entitled, “The Fence,” the basis for a short film that won the Director’s Award at the UCLA Film Festival a few years back. Before leaving town, we stopped by the Capitol to take a picture. 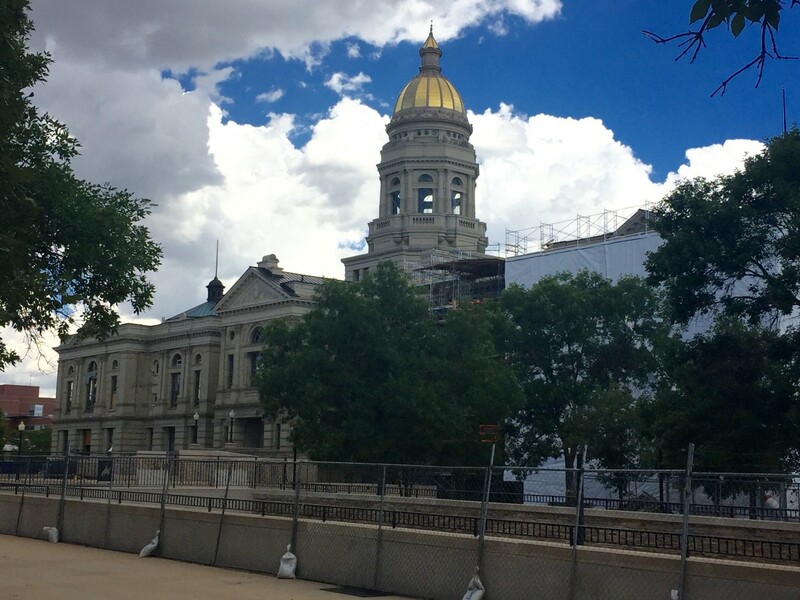 Even under construction, the gold dome gleamed in the spotty afternoon sunlight as a thundercloud approached. I had always imagined Casper as a bustling city in the middle of the high plains, jammed with oil and gas rigs and production facilities surrounded by miles of sagebrush. 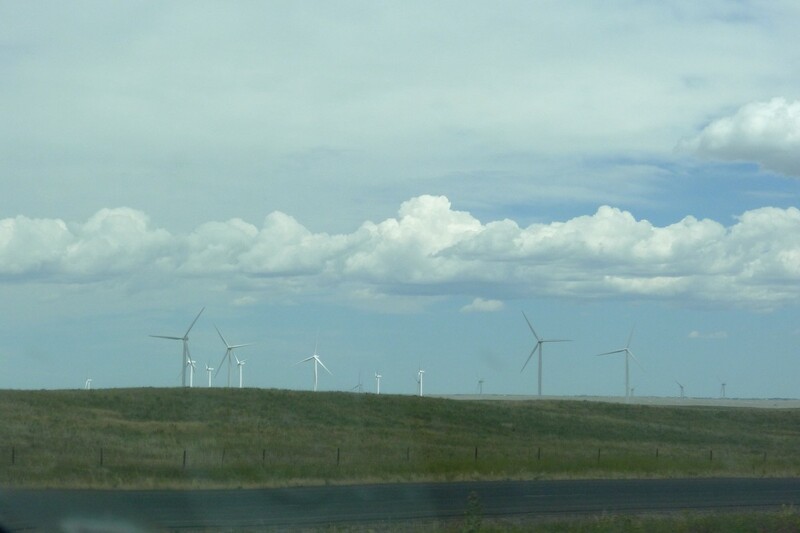 In many respects, it still lives up to its image as the energy capital of the state, albeit now with the dramatic addition of giant wind turbines strategically located on windy ridges along the interstate. I didn’t anticipate the refreshing beauty of the North Platte as it winds northwesterly through the city, a vital source of river water offering weary travelers shady respites along its banks, much like the mid-1800s when covered wagons intersected the city on their westward journey. Nor did I envision Casper Mountain overlooking the city like a proud mama bear protecting her own. As we followed the switchbacks up the mountain early Monday evening to reach Sunburst Lodge, we were enthralled by the changing landscape and beautiful vista of the city three thousand feet below the summit. In the rearview mirror, I caught a glimpse of a sturdy woman in her seventies motioning us toward the lodge entrance. The proprietor, Nancy Yust, summarily greeted us with directions for parking the car and disposing of our luggage inside. Nancy showed us around, weaving in tidbits of history and lore as a longtime rancher in the Casper Valley as we walked. She proudly pointed to the “treehouse,” a newly constructed two-story log house perched on lodgepole pines a short distance from the lodge. She expressed confidence that she would overcome the permitting obstacles by New Years, in time to watch Super Bowl 2017 from her new vantage point. Later, as we were admiring the amphitheater built into the steep hillside below the lodge, Nancy pointed out a large round white structure at least a quarter mile downslope on her 150-acre property. I got the impression that Nancy was a woman of significant means and this extravagantly beautiful lodge and the adjacent structures were interesting, creative projects for her. 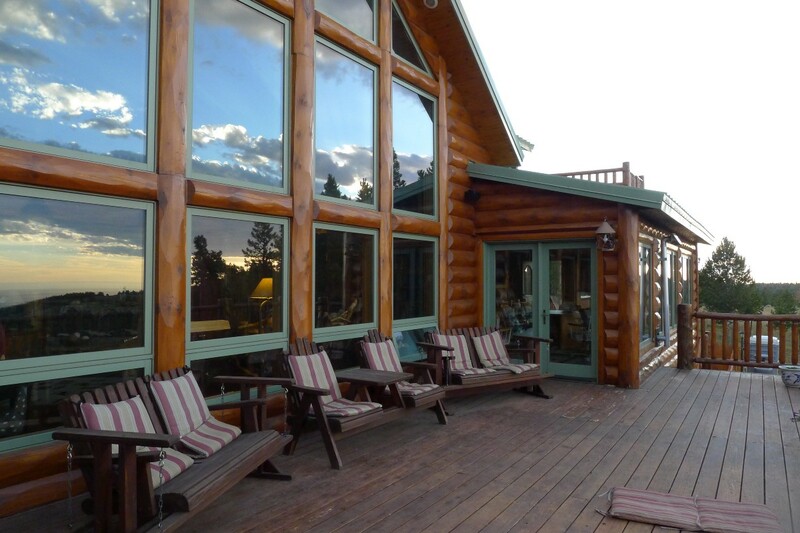 After taking a four-story elevator to reach the top floor of the lodge, we were amazed to find one grand room whose sole purpose was to provide an unobstructed view of the Casper Valley below. When we exited the elevator on a lower floor, I mentioned that I would need to get off the mountain the following morning in time for my ten o’clock book signing at Wind City Books. As we toured all six bedroom suites on several floors, Nancy peppered me with questions about the novel. She pressed me for a copy of the book, and when I retrieved one for her, she declared she was going to read it overnight. I never doubted her resolve. She was the quintessential Wyoming woman — hard-working, strong-willed, and independent. A woman who defies stereotypes. Later, Nancy regaled us with a story that left us laughing all the way to our bedroom. A few years back, Nancy’s daughter called and urged her to buy up eggs for the B&B because the hens in the region were targeted for slaughter due to an avian flu scare. She was sure eggs might become unavailable for weeks, or even months. Nancy leaped into action and called a woman friend for help. “How many eggs do you want me to buy?” her friend asked. “I don’t know exactly. Just buy enough,” Nancy replied. The next day, when her friend delivered a truck load of eggs to the lodge, Nancy was shocked. “What do you expect me to do with six thousand eggs?” she bristled. Her friend was taken aback, and Nancy quickly realized she needed to figure a way to salvage five hundred dozen eggs. She enlisted her friend’s aid in the endeavor. For several days, the two women broke a dozen eggs at a time into a bowl, stirred them loosely, and poured the soupy mixture into double ziplock bags for the freezer. Before the project ended, Nancy had to purchase another commercial freezer to hold the additional freight. I asked her if she had purchased any new eggs since the debacle. “Oh, yes,” she said. “I often have to buy eggs because a dozen eggs is too many for a small group of guests like you guys.” We figured that with the cost of the new freezer, each egg cost about fifty cents — not a money-saving venture! The next morning, bags packed, I found Nancy in the gourmet kitchen fixing breakfast for us. She could hardly wait to tell me that she had read most of the book, “all except some chapters in the middle,” because she was eager to get to the ending. She complimented me on the writing before blurting, “but I didn’t like the ending.” She found it too ambiguous. I liked her straight talk, and explained how I came to that ending. This led to a lively discussion in which she encouraged me to continue the story — basically suggesting a sequel was in order! 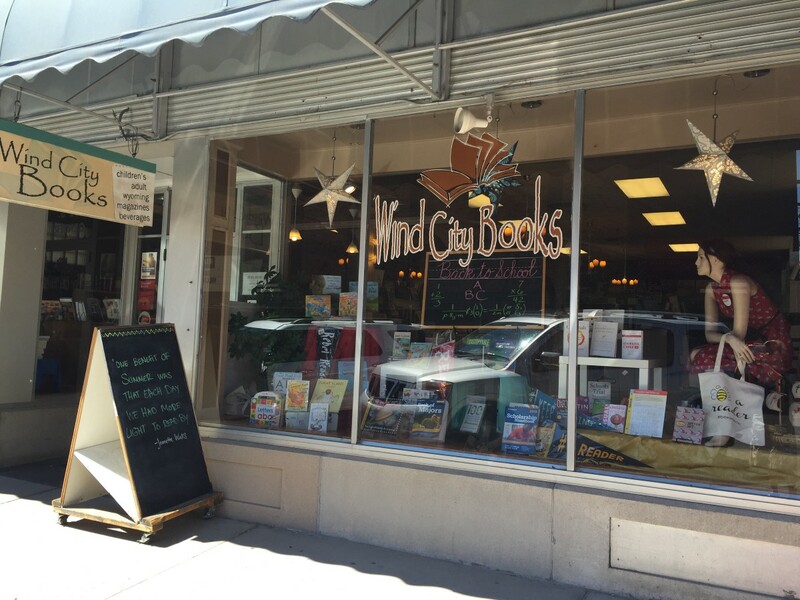 We arrived at Wind City Books at ten o’clock sharp — a mere twenty minutes’ drive downtown. A young woman named Heather Watson greeted me and introduced Hugh Jenkins, the co-owner, before showing me to the small round table set up for the book signing toward the back of the store. The table was visible from the store entrance where loyal customers stopped by the coffee shop for their morning lattes. I immediately felt the welcoming, friendly atmosphere. Within a few minutes, some customers approached my little table and inquired about my book. “Why Hardpan for the title?” asked a young college student who quickly divulged that he was looking for a summer job in Casper. He said Casper was a locus for jobs in central Wyoming. I wished him well on his search, and encouraged him to complete his college education. Luckily, he didn’t take offense at my parental counsel! As the young man walked away, a couple vacationing from Durango, Colorado stepped up. Steve and Betsy Iwanicki had read the announcement about my book signing in the Casper Star Tribune that morning, and decided to stop by. When I learned that Steve is the U.S. Sales Manager for a book manufacturing company, we compared notes about the book publishing world. 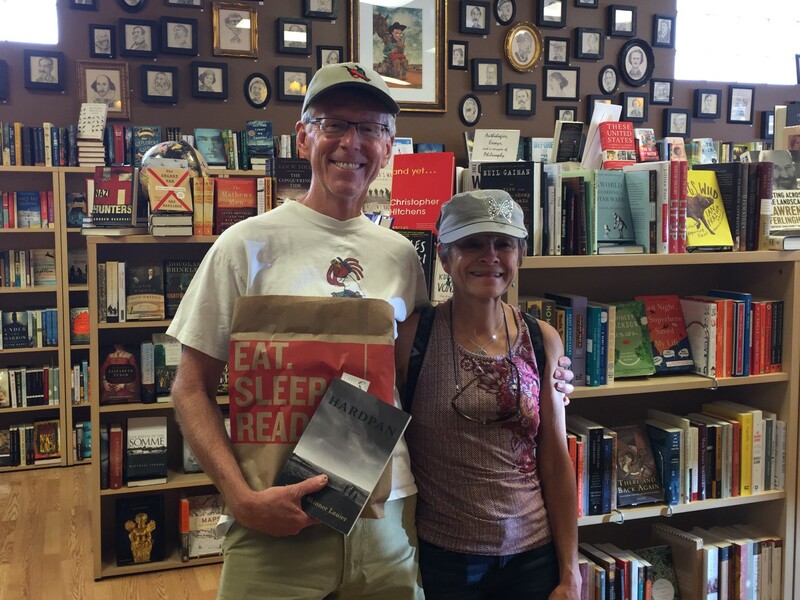 Before leaving the store, Steve & Betsy posed for a picture with their new purchase! 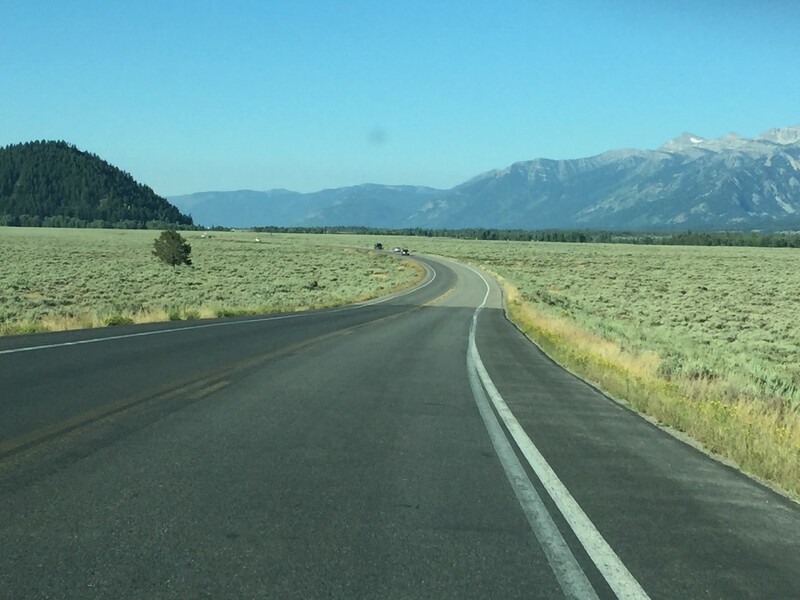 The four-hour drive from Casper through the Wind River Canyon to Cody proved to be the perfect interval to savor the sweet prospect of returning to my family ranch in northwest Wyoming, the setting for my novel. So many years had passed, half-a-century, since my parents packed up our family belongings in the ’53 GMC pickup and drove from Badger Basin through Cody on our way to California. 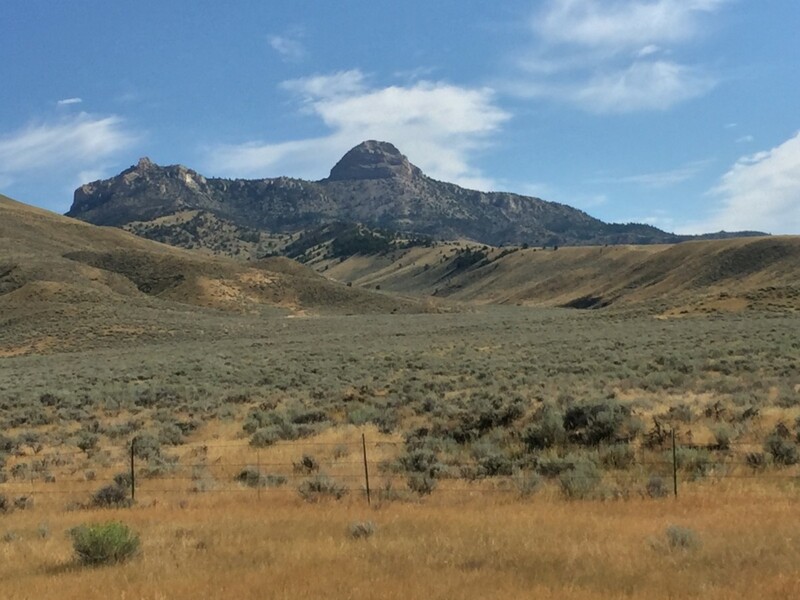 And so, as we drove over the hills into the dramatic Shoshone River valley, while I instantly recognized the iconic shape of Heart Mountain in the distance north of Cody, I had to rack my brain for the name of the saddle-shaped mountain sitting alone in the high desert, a few miles east of the towering Rocky Mountains. “That looks so familiar,” I shouted, my pulse quickening at the sight. 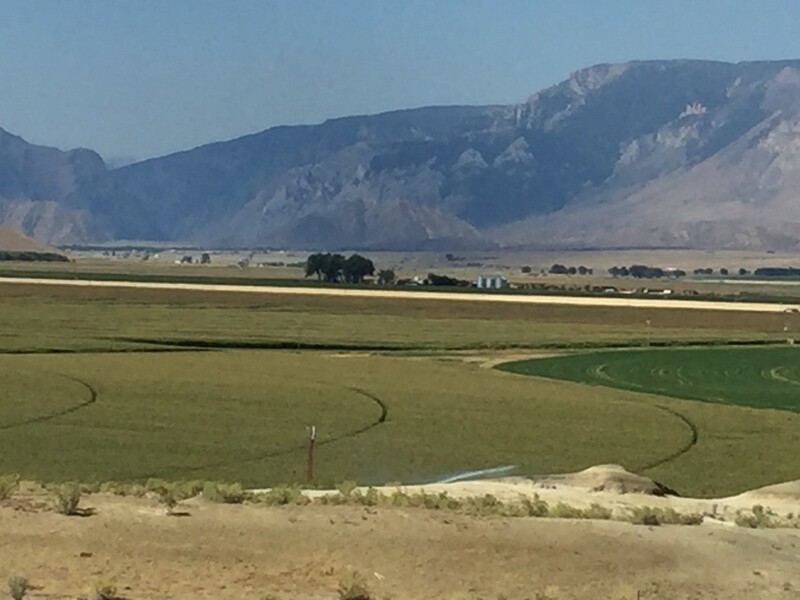 Heart Mountain is centric to the region extending north of Cody to the Montana border. 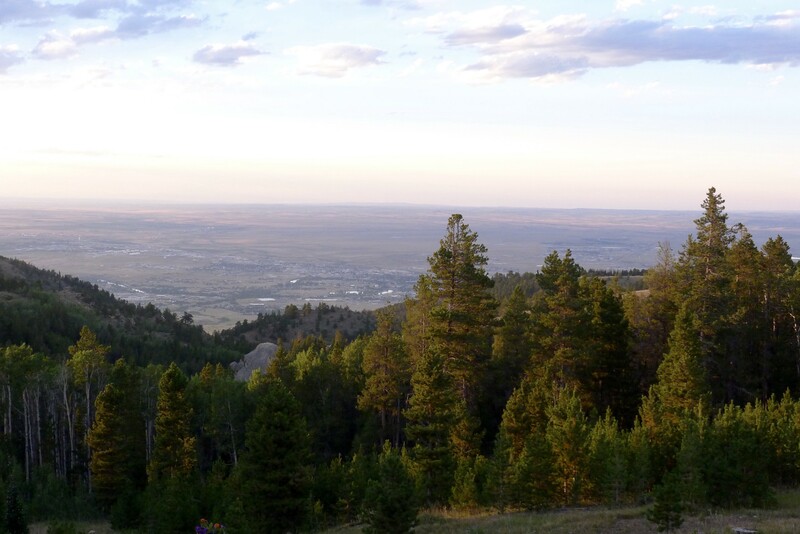 We enjoyed vistas of three sides before departing a day later for Yellowstone Park. The only side we missed was the eastern slope, between Powell and Cody, the infamous location of a Japanese internment camp during World War II. We spent the night in a forgettable Cody motel, one of the most expensive of our trip, across the street from a recently renovated McDonalds. At least we were well-positioned to take in nearby historic tourist places like the Irma Hotel, where they stage gunfights on the street several nights a week during the summer months. 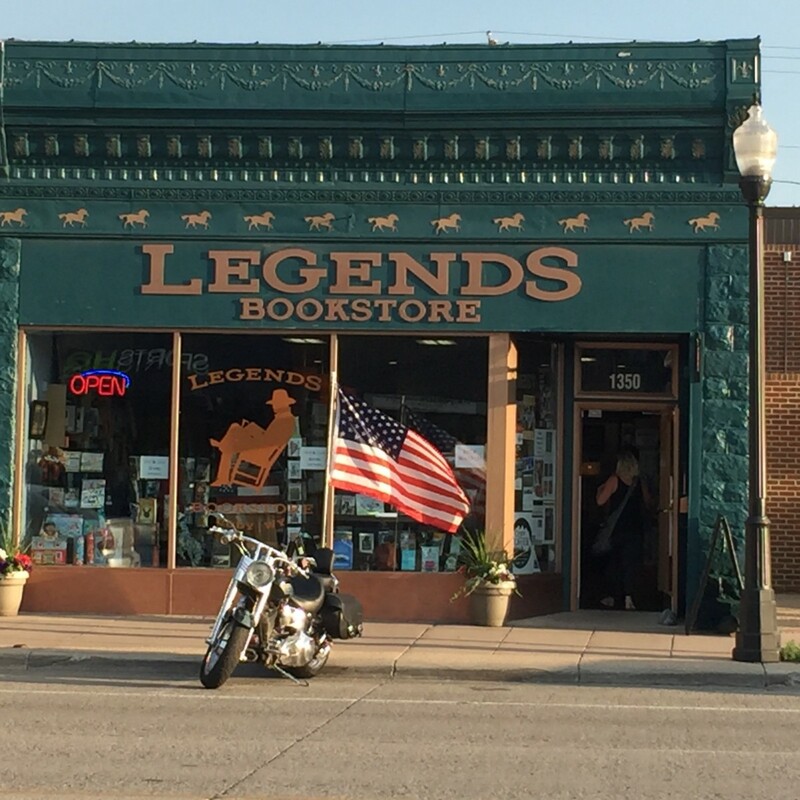 As it turned out, the Legends Bookstore was the only Wyoming bookstore where I hadn’t been able to secure a book signing. The owner, Teresa Muhic, had declined my request ahead of our visit because she had to help move her parents that week. Perhaps sensing my disappointment, Ms. Muhic encouraged me to contact the manager of the Park County Public Library, Marge Buchholz, who often sponsored book events at the library. When I followed up by phone with Ms. Buchholz before our trip, she said my timing wasn’t good for a book reading, she was very interested in my book as an addition to the library and invited me to stop by during my book tour. 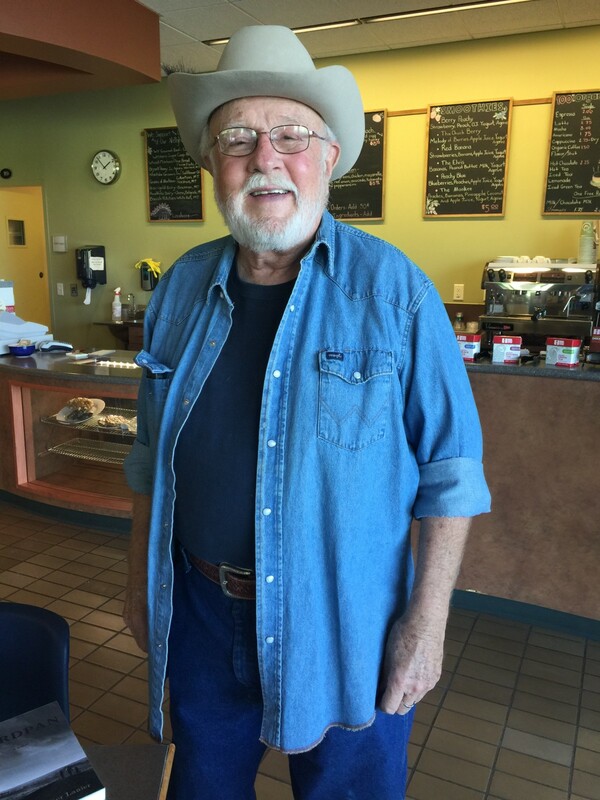 The next day, after visiting our family ranch (see next part), we returned to Cody to see the Park County Public Library and have lunch at the Bistro there with Malin Foster, a lifelong friend of Donna Markle, a Wyoming native and early fan of my book. As we drove up the bench to the library, I was taken aback by its grandeur: a beautiful three-story brick building, contemporary in design, surrounded by manicured lawns and stately landscaping. I learned later that Marathon Oil had donated the building to the county for a dollar when the company relocated its headquarters to Casper a few years ago. That explained why the library inhabits the building along with a number of county offices. Sweet deal, I thought! At the front desk, I inquired about Marge Buchholz. To my surprise, the receptionist recognized my name and offered to find Ms. Buchholz. I told her I would be in the Bistro having lunch with a friend. In the Bistro, I stopped at the first table I encountered and asked the woman if she were Malin Foster. Her puzzled expression said it all. I didn’t have the right person. Within seconds, a man with a cowboy hat and warm smile strode across the room toward me. As he gripped my hand in greeting, I instantly recognized my mistake. Nothing womanly about this guy! Luckily, I didn’t have to own up to my error, instead focusing on where we would sit and what we would order. Sometimes the mundane is helpful. It was such a treat talking with Malin. Though he had lived for many years in Utah where he was a journalist, worked for the UPI, and served as former press secretary for a Utah Governor, he had retired to Cody because of his need for unpolluted air. He pointed out the advantages of living in a windy place! Malin was familiar with the Clark Valley and teased me about my unique status as a “Clarkian” because there were only a handful there. He told me how a mother grizzly bear with three cubs, a rarity, had been sighted near the Clarks Fork this spring. Grizzlies have been expanding their territory beyond Yellowstone Park for several years. Malin asked if we had read the headline of today’s Cody Enterprise. When we gave him a blank stare, he pounced on our news vacuum. Imagine our surprise as he recounted how a staged shooting in front of the Irma Hotel had gone badly awry the night before. A woman tourist, apparently a volunteer for the show, had been wounded by a real bullet instead of the traditional blank. Though she fortunately wasn’t badly hurt, Malin was certain this episode would revive an old debate in the town about shutting down this re-enactment, a legacy of Buffalo Bill’s Wild West Show begun in 1883. I haven’t heard the outcome of this latest episode, though I’d be surprised if the opponents of the show prevailed. 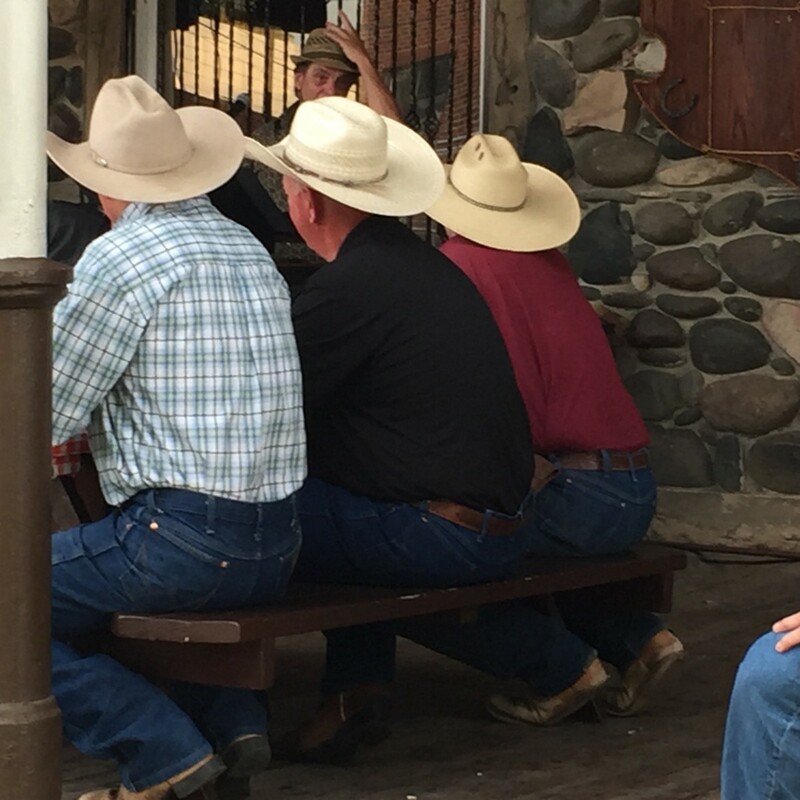 Pride in traditions of the Old West show up everywhere in Cody. 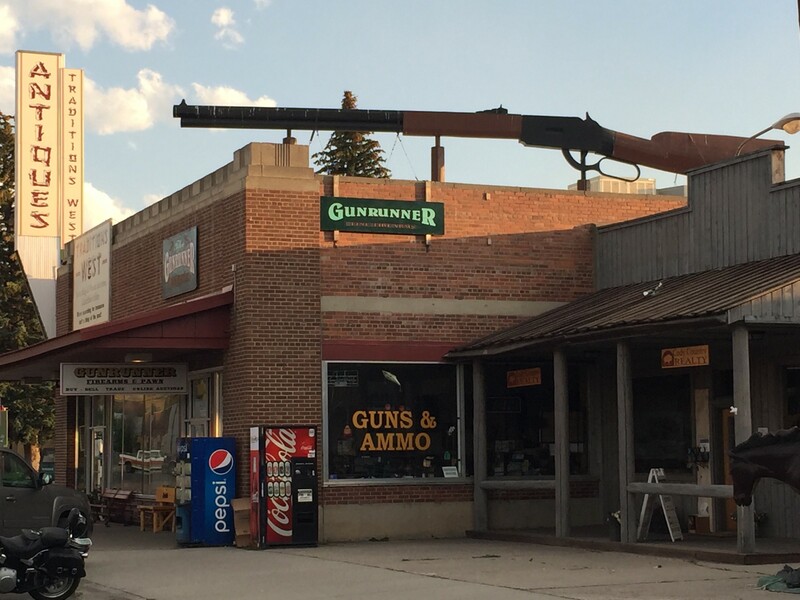 The Guns & Ammo store with its gigantic rifle overhead is only steps away from the Irma Hotel and a few blocks from the Legends Bookstore on Sheridan Street. There’s clearly a strong desire to retain the flavor of the Old West through the gunfight re-enactments, the nightly rodeos, and scads of Harley-Davidsons. Yet these happily co-exist with a very visible literary culture featuring first-rate history museums, bookstores, and the beautiful public library. As Malin and I talked, Marge Buchholz wheeled a book cart alongside our table. She was on her way to a late lunch and offered to show me the large multi-media room available for book readings and other community events. As we toured the Grizzly Room, she invited me to return to Cody for a book reading and to the Winter Gathering in January. I was fascinated to learn Marge lives on her family’s pioneer ranch on Heart Mountain, in the same area used by the federal government to intern Japanese-Americans during World War II. When I expressed an interest in visiting her ranch on a future visit, she graciously extended an invitation. Both Marge and Malin encouraged me to attend the Winter Gathering in the dead of winter when they estimated forty percent of the town’s stores shut down and residents gravitate to community events for entertainment and literary diversions. I promised to attend if possible. We got up at sunrise Wednesday morning. I waved off a pancake breakfast at a local cafe in favor of a Big Breakfast at McDonalds in order to get on the road more quickly. 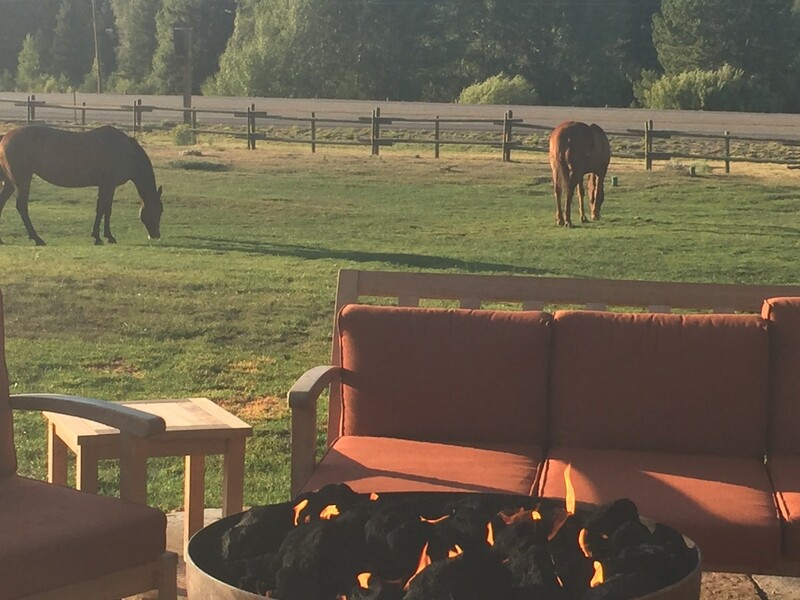 Our family ranch in the Clark Valley beckoned 30 miles north of Cody off Hwy 120. I was keenly aware our visit to the ranch would be time-constrained due to my luncheon appointment with Malin Foster. As we got on the highway, Bob asked if I knew how to get to the ranch. “Of course I do,” I replied, taken aback by his question. How could I forget that place? I remembered the old road before it was paved in the 1960s, and the sagebrush covered hillside as it descended the bank of the Clarks Fork River. “Just before the bridge crossing the Clarks Fork, we’ll see the lane on the left,” I said confidently. He knew what I meant, having seen old photos of the ranch, and of the Clarks Fork River bisecting it, during the years I spent writing my first novel. So we drove ahead without benefit of a detailed map or GPS. I couldn’t believe we got to the river crossing in less than half an hour. During my childhood, my folks were accustomed to an hour-long drive to Cody. Thirty-six miles over gravel and dirt roads, sometimes with flat tires or winter snowdrifts prolonging the trip. But the Edelweiss Tavern on the right side of the highway threw me off. Okay. So a commercial establishment had been constructed way out here. 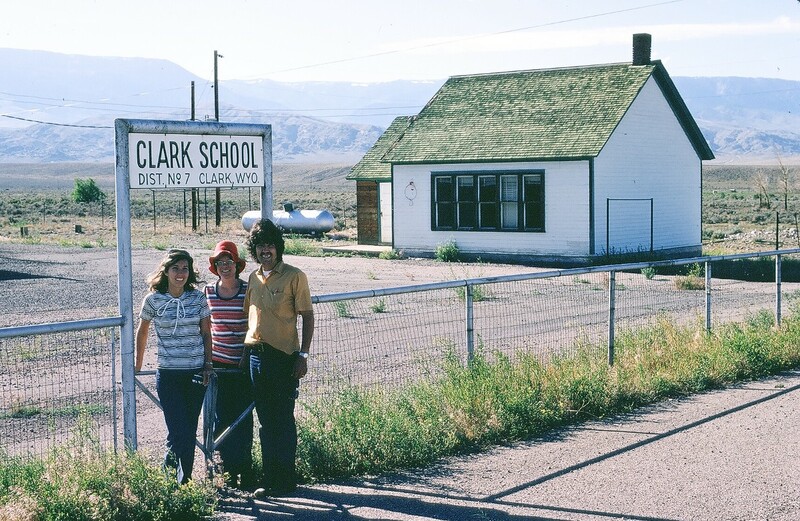 A small sign on the left, “Clark,” was the only indication of the Clark Valley. “Shall I turn left here?” Bob asked me for directions. “No. It doesn’t look right,” I said after surveying the river banks. The terrain looked foreign. The banks were half the height I expected. This must be a new river crossing, I thought. And where was the lane to our ranch? Not here, for sure. I directed Bob to continue north on the highway towards Belfry, Montana. Surely we would soon encounter a second river crossing! We drove on a few miles, passing by an area that reminded me of the abandoned gas field where we lived after moving off the ranch in 1956. Must be Badger Basin, I thought. We returned to the first river crossing and turned west toward the mountains. 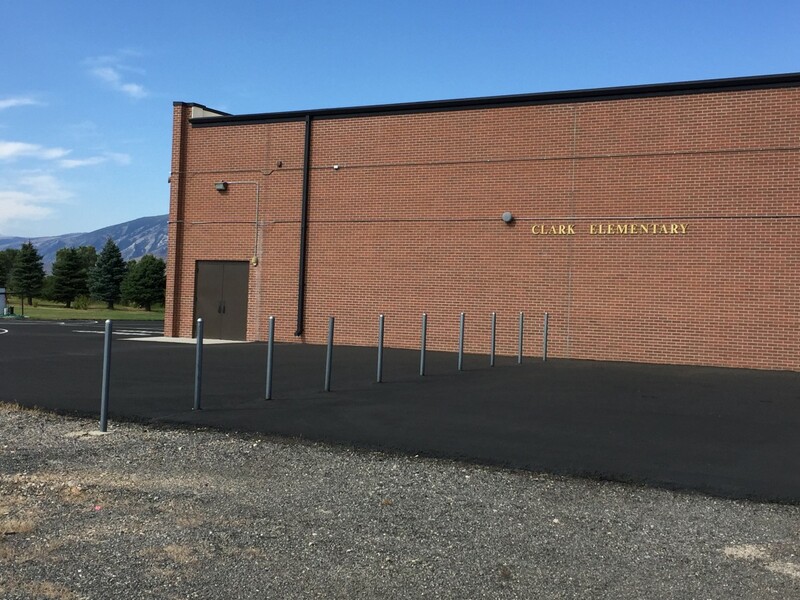 I was befuddled by the rural roads going westerly directions like spokes in a wheel, but I knew we had to be close to the Clark Elementary School. At the next fork in the road, I pointed right. We gasped together when we saw the new elementary school down the road a few hundred yards. “That’s it!” I said, knowing this new brick building — a gymnasium and five classrooms — complete with fenced in parking lot, playground, and green lawn on the south side, was a replacement for the lower- and upper-grades school houses that my two siblings and I had attended in the mid-1950s (below photo of the Clark lower-grades school house was taken in 1973). When we got back into the car, I knew the ranch was nearby. We had to find the Clarks Fork again, somewhere northwest of the first river crossing. Another fork in the road. Moments after we turned right, I noticed three workmen standing alongside one of their communications trucks. I soon learned that they were installing fiberoptic cable to homes in the Clark Valley, “fiber to the premise” as they described. One white-bearded man, Ed Webb, raised his arm. “Yeah. I’m local. Live in Belfry.” I hastily explained my dilemma in finding my childhood ranch. I gave him a few local landmarks and some ranch family names, our former neighbors. He stopped me. “I know where your ranch is,” he said. He also knew the people that I mentioned — folks like the Torczons — and that they currently live in Powell and Cody. I repeated his directions to be sure I understood, and gave him an inscribed copy of my book as a thank you gift. As I turned to leave, one of Ed’s colleagues offered to lead us to the ranch lane. We gratefully accepted, not wanting to take any more chances. As we approached the second river bridge a mile down the road, we turned into the lane behind our guide’s pickup, both vehicles coming to a quick stop. “Just a minute!” I shouted. I walked around the car and reached for his hand, planting a heartfelt kiss in gratitude. “Thanks for bringing me home!” I said. He seemed surprised but pleased at my spontaneous gesture. As expected, the old two-story house was gone, having burned down sometime in the 1990s, but the row of cottonwoods lining the old dusty lane looked the same. The river had the same trajectory toward the Yellowstone that I remembered, albeit there were three custom homes on the east bank — a sign of more affluent times. There were other signs that the ranch was thriving. A swath of golden wheat wafted in the warm breeze, and deep green freshly mowed alfalfa fields formed a horizontal band beyond the wheat fields. 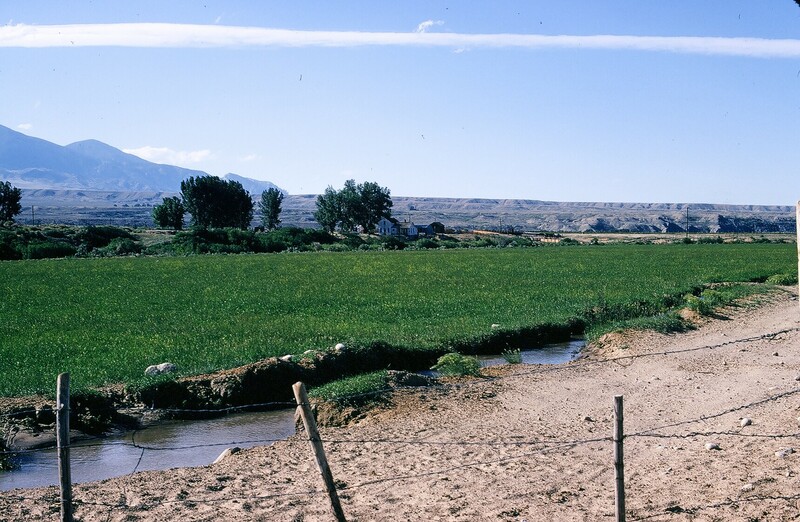 The huge circular irrigation systems were such a contrast with the old-school model that had my father tamping down mud on my mother’s homemade canvas dams to redirect water from the irrigation ditches to the fields — dams on ditches that could be wiped out by a single afternoon cloudburst from Line Creek Canyon. I concluded that the ranch was benefiting from being managed by a corporation that had the investment capital needed for more efficient operations. It was getting close to noon when I woke from my reverie about the ranch. We had to get back to Cody to meet Malin Foster for lunch at the Bistro in the Park County Public Library. Bright and early the next day, Bob and I left Cody — the east entrance to Yellowstone Park — for our final destination on the book tour: the Valley Bookstore in Jackson where I had scheduled a book signing, more like a meet-and-greet, for 10 o’clock on Friday morning. I was excited with anticipation about the beautiful drive to Jackson. The itinerary was almost identical to the roads my family took many times during warmer months in the 1950s to visit my grandparents’ ranch in eastern Oregon. Winter months required a northerly route through Bozeman, Montana because the east entrance to Yellowstone was closed (still true today). Just as I recalled, the highway along the Shoshone River severely narrows through Shoshone Canyon as we approached Buffalo Bill Dam and Reservoir a few miles west of Cody. 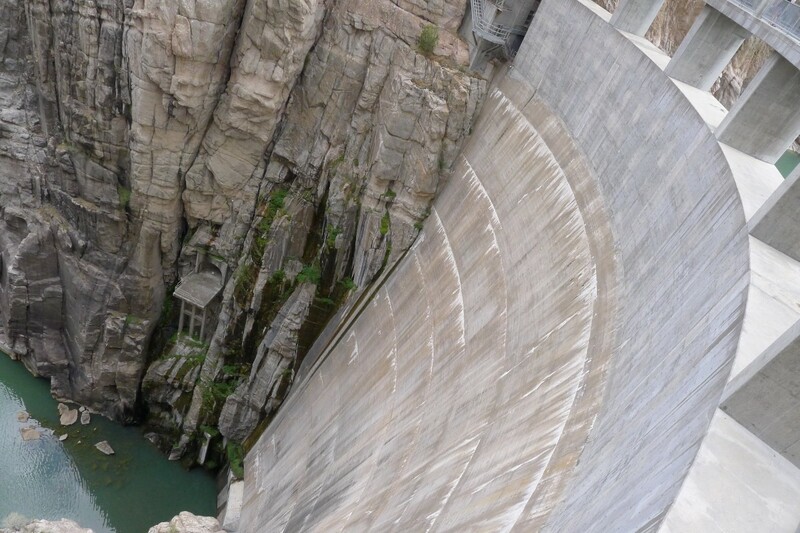 When construction on the dam ended in 1910, it was touted as the world’s tallest dam. It’s still an impressive structure, offering a dizzying view of water from the Shoshone River trickling far below. Shortly after leaving the Hatchet Ranch, we joined the main highway going west some thirty miles into Jackson. I found myself mesmerized by the lushness of the narrow valley known as Jackson Hole that threads along the Snake River into Jackson. 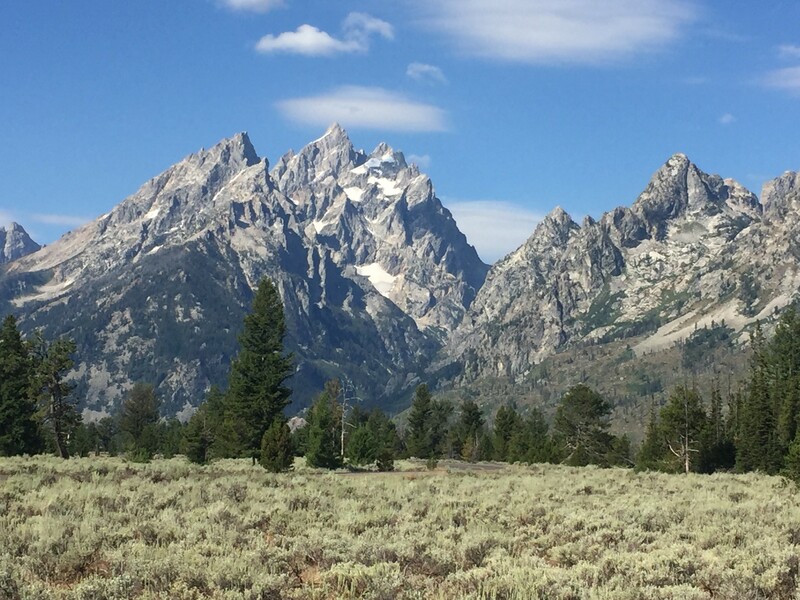 With the spectacular Tetons as a backdrop, this valley is a feast for the eyes as well as the soul! In Jackson, before finding the bookstore at 125 N. Cache Street, we discovered the Cowboy Coffee Company, a popular espresso shop with the same address. While waiting for our morning latte, we found the bookstore around the corner in an interior boardwalk of shops called Gaslight Alley. 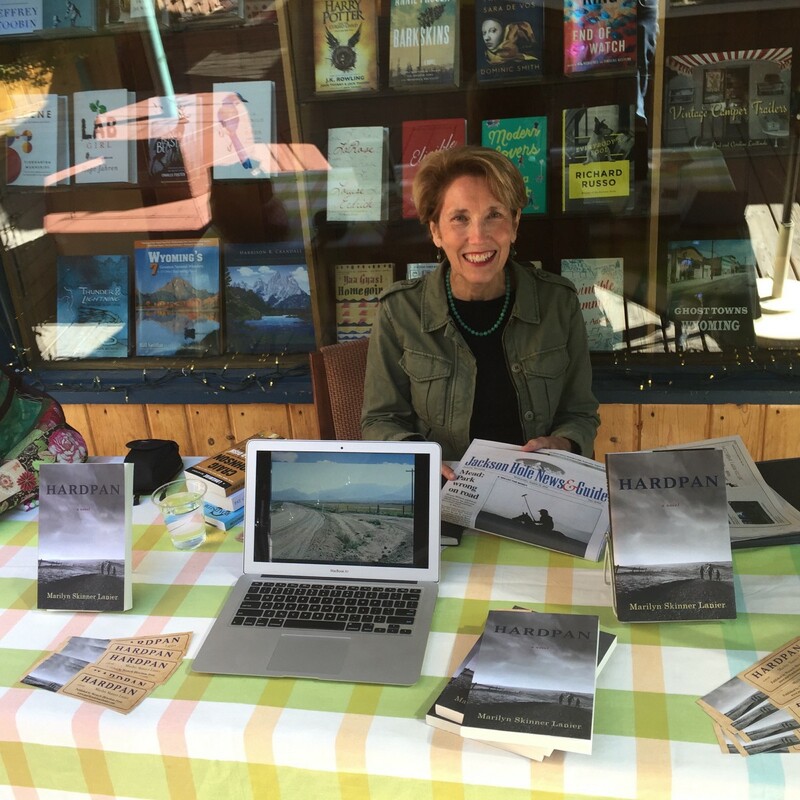 I shared my story about having lived on a cattle ranch in Clark, Wyoming during the 1950s — the source of inspiration for my debut novel, Hardpan. Invariably, the passerby would peer closely at me as if to sniff out the truth of the story. Within minutes, my visitor would turn back to me and smile. “That’s really something! Now, what is your book about again?” or some such rejoinder.